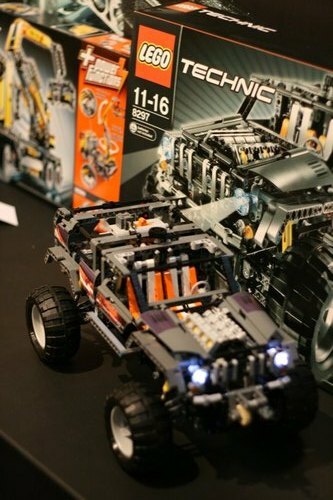 Pocket-lint went to a Toy Fair and saw in first hand, the current prototype of the upcoming, LEGO TECHNIC 8297 Off Roader set. The Off Roader is a 4x4 truck complete with working doors, motor with piston heads, steering control, cool real headlights, electric powered winch and a motor that raises the suspension up and down so it can drive over obstacles. See below additional photos with some other details (click over images, for larger versions). From these, we can already conclude about some questions raised when at the model first 'appearance'. Tires do not seem to be the same size of the huge ones at 8466 (4x4 Off-Roader) anymore. There is in fact a pair cool and shinny PF white headlights. 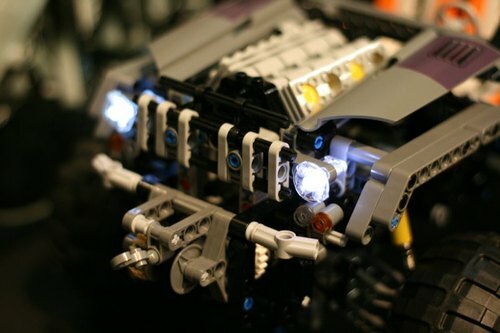 They must be some kind of LEDs, instead of the old fashioned yellow LEGO lamps. Finally and after a strong defeat of the Orange shades on the poll results, that finished yesterday (but, that's a subject for a further post...), it is with great pleasure that I see several Orange TECHNIC Bent Liftarms present in this Off Roader model (see them at the car seats). And if I'm not wrong, it is the first time that Orange parts appear into the TECHNIC mainstream models. -I'm a little disappointed with the tires. -Since we have one motor and two electric functions (winch&suspension) we should have a small gearbox system like in the Cherry Picker? Or could we do the same thing with the pole reverser? What about the lights? On the previous post where I spoke about this set, there was already something pointing that direction. However is still uncertain if that probable gearbox is used for the tranmission or most likely to switch some motorized functions (e.g. Winch, Suspension, Headlights)!?" Wow, this set looks fantastic. I am planning to buy two of them, as I am needing 8 big wheels for a model I want to make. 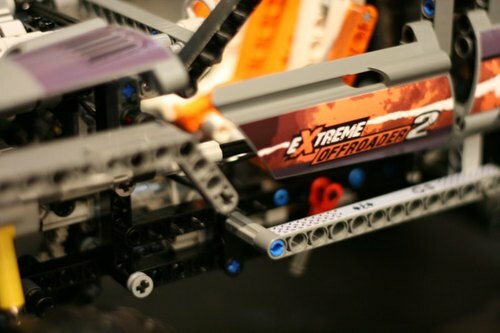 I really hope these wheels have decent traction, as that is extremely important with mindstorms models. I wonder if Hitechnic are eventually going to make a new IRlink sensor NXT-G block, so that it can also control lights and pole reversers. 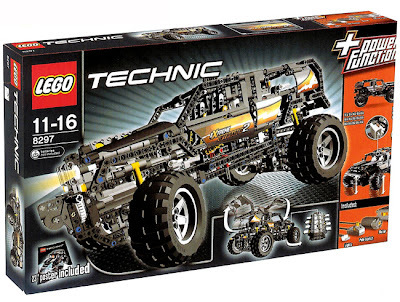 By the way, are there any new images of the other late 2008 sets? I think I see the edge of one of their boxes in one of these photos, and I would love to see detailed images of them as well. I guess new PF Pole Reverser shouldn't be controllable from NXT via IR, as it is just an actuator. Also believe the lights could "already" controlled via IR with the current NXT-G block, as they should behave similar to a motor. You just need to connect them behind a PF RC Receiver. 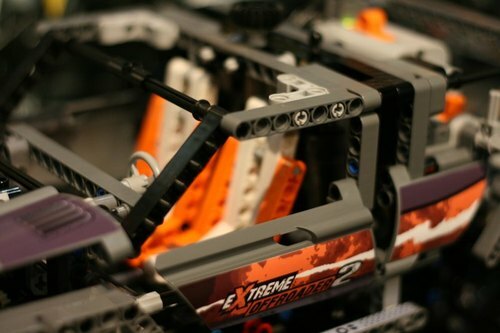 Haven't seen yet real photos from the remaining 2nd half 2008 TECHNIC sets. The box edge you see on the side, is from the already launched Cherry Picker (8292). I'm a bit dissappointed about the tires, too, but afterall it's a little comprehensible: with Power Functions onboard, there wouldn't be room for much expansion on this price tag. 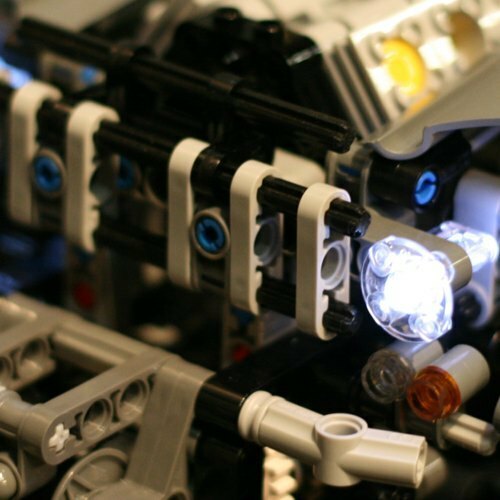 As for the headlights, I agree that they must be LEDs, because of the blueish hue; incandescent bulbs are much more yellowish. But I still haven't figured out how do they connect to the power source. This is what I think PF is used for: the pole reverser switches the headlights on and off, and the motor goes through a gearbox to split functions between the winch and the suspension. 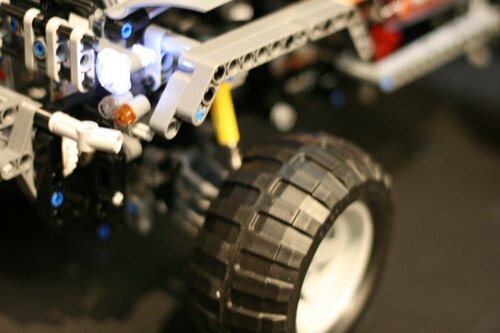 IMO: the lights are on when the battery box is on, the pole reverser switches the motor, and on the opposite side a lever switches the gear shift function, between winch and suspension. That's what I guess too! I think the hypothesis from AVC, to be less probable. I still think the pole reverser controls just the lights: the motor can be in an "idle" position when the shifting lever is between the two functions. P.S. A thought has just occured to me... if the designer responsible for these new sets is a TBs reader, I wonder how hard can he/she be laughing at our attempts of decyphering pictures! Where do you see those transparent stickers? Conchas, transparent stickers are on both sides of the engine, rear end of the fairing; in first photo compare with box, I think they are intended to look like a grille in the engine hood. It should be some effect from the flash. Alex wrote "As for the headlights, I agree that they must be LEDs, because of the blueish hue; incandescent bulbs are much more yellowish." I suppose the tyres are the same as rear tyres in 8284 tractor (94.8 x 44R Balloon). It is the currently most accepted hypothesis at several forums. 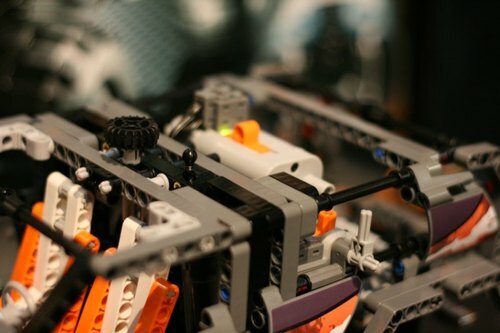 I myself have commented on that at this post on Eurobricks. I have tens of ideas listed in a queue, to post and some already written in the 'Drafts'. Because if you look close into the picture from the box, you can see the typical three pins inserted into the wheel. Better you see on this one (larger). is the offroader a 4x4 ?? i havent buy the offroader. 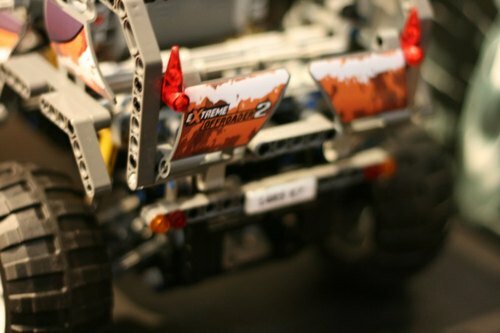 I am very disappointed with all of these comments about the new Lego 4 by 4 off Roader. All of you people are driving me crazy about these comments about how bad the tires are. 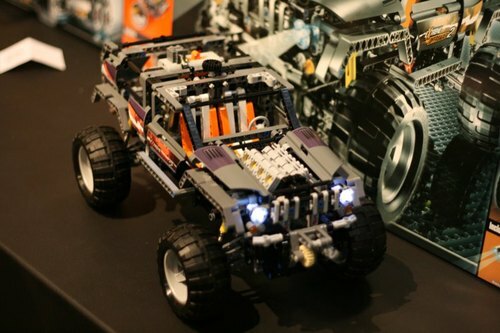 I think all of you people are jealous that you cant build something this cool so you talk about the tires. 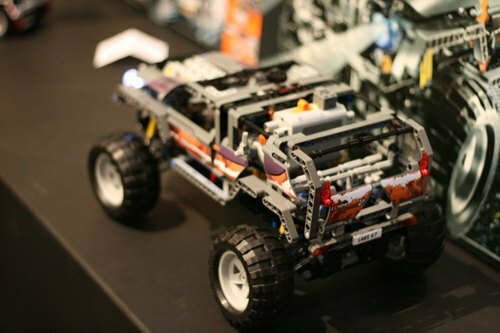 The Lego people who made this used the perfect tires. The tire have no problems and are the only tire that would look cool and make the car sick. So quit making the Lego people feel bad. If you don't like it don't buy it.